DARCO Elastic Tape is an elastic sport and therapy tape made especially for use in applied Kinesiology. 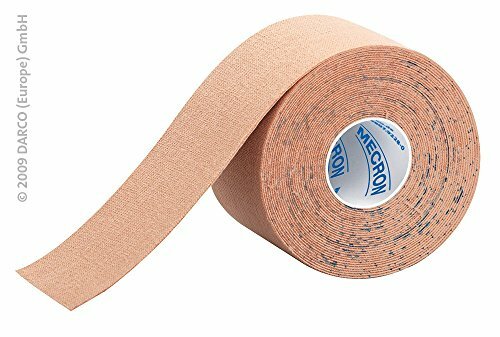 Kinesiology tape is used worldwide by athletic trainers and physicians alike because it provides portable and immediate treatment of muscle, fascia and tendon symptoms and for performance enhancement by way of continuous receptor stimulation. The natural healing process is enhanced due to improved circulation in the taped areas. Stimulates circulation: increases both blood flow and the flow of lymphatic fluids to promote healing to the affected area. Improves performance: by facilitating greater range of motion during use. Water resistant: tape stays on for days or until the wearer wants to remove it. Extremely Cost-effective: Identical performance as other brands at a fraction of the cost. If you have any questions about this product by Darco, contact us by completing and submitting the form below. If you are looking for a specif part number, please include it with your message.